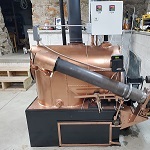 I am new to the forum, and potentially new to coal heating, I have been successfully heating with a gasification wood boiler for 12 years, but I am considering making the move to a coal stoker boiler. Getting older doesn’t really help when it comes to cutting and splitting wood, and while I will miss the “free” fuel, I won’t miss the back aches, lost family time, and mess associated with cutting that much wood every year. Anyway, to the point of the post—I am just starting to look into various stokers, and I wondered if there were any advantages of choosing one style over another. I live in western PA, so I have so far looked a little at Keystokers and Coal Guns, as those are both made not too far away. Are there others I should consider? Advantages or disadvantages in terms of coal consumption, reliability, longevity, etc? Any input or guidance as I continue my research is greatly appreciated. A lot of people turn from wood to coal as the get older and smarter. To me the ultimate in coal heating is an auger fed stoker boiler. My thinking is, if you are going to automatic coal heat, there is no sense in filling a hopper every day. Put the auger in the bin, take out the ashes every few days. I would recommend, Axeman Anderson, AHS (with the auger option), EFM, Gentleman Janitor, Van Wert. The new DS stoker boiler also looks pretty dern good. Here are a few video playlists of auger fed stokers. The size requirement can be a large factor. What size is your wood burner. Nice Job,Stoker Don! Those Vids should give him something to chew on for a while! Homework does make for the best,educated choice to pursue!! My current wood boiler is rated, I believe, at 137000 BTU, if that helps. This is excellent!!! Thank you for the video links. I will check these out. Never though of auger vs hopper before, but it does make a lot of sense. For what it is worth, I rescued an Axeman Anderson 260 4 years ago and finally got it up and running three weeks ago. My original heat was a hand fed coal stove in the basement and an oil fired hot water baseboard system. Since I fired up the AA260 I am absolutely amazed at how well this unit works and how little I have to do to keep it going. I check the boiler everyday and empty the ash when needed (in my case it as about every 5 days this is not the norm). Once a week I check the oilers and the gearboxes. Other then that I pretty much let her eat those beautiful black little rocks. I piped the AA260 into my existing oil boiler and have nut burned one ounce of that horrible dinosaur juice since. The Axeman Anderson's were built to last and all parts are still readily available. If you watch Craigs list someone always has one for sale and if you are lucky enough you can find a 260. Listen to the experts here they really know what they are talking about. Always glad to see a wood burner who is ready to give up the "free wood." We all know the costs of "free wood." When I made the switch I made the mistake of not considering a used refurbished boiler and bought a new Harman VF3000. It was what I could afford at the time in a new boiler and it sort of worked for me for many years until I got tired of it sort of working for me. Then I bought a 1981 EFM 520. There are 2 for sale here on the forums classified section. There's also a GJ boiler although it may not be powerful enough based on the BTU of your current wood boiler. My best advice to you is buy a used stoker boiler and never look back. Welcome. I am a former wood burner myself, and have burning anthracite for about 10 years. Pretty much any of the stokers on the market will do a good job if you size and install them properly. I like units that come with an auger, but the others can have them added if you want. Back to your wood boiler - A gassification boiler can be very efficient if installed and operated properly. It sounds like the part you are trying to get away from is the cutting and splitting of the wood. Have you considered just buying a load of split wood from a local processor? Yes, I have considered buying wood as an option. Cutting and splitting is definitely something I no longer have time or energy to do. I am also hoping to not have to load the boiler every day, worry about the wood bridging and the fire going out, etc. Just seems like a stoker is much less work. On another note, you are right,...the gasser has been a great setup for us over the last 12 years. Burns clean and efficiently...about 5 cord of wood per year give or take. We installed radiant in floor heat/pex and zone valves, and have loved the warm floors. I will essentially be taking that boiler out and plugging a stoker into the same system. Another vote for the Axeman here. To be honest, all the brand name boilers are well constructed and reliable, you really can't go wrong with any one of them. They all have quirks and outstanding features as individuals. Educate yourself and figure out what you lime and join the club. Partial to the EFM 520 here. I have one, my brother, son and neighbor. I auger straight out of a big coal bin. Wouldn't discount AA130/260 or the new DS stoker. Helped change out a couple friends who had Keystokers. No reason other than filling the hopper, which could have been solved with an add on auger -- but. EFM's are super easy to start the fire in. My review on Leisure Line AA-220 boiler....Pro's- can buy new, very good customer service, UL listed. Con's- Advertised rated output is Gross not net, access to stokers is not ideal which makes it difficult to see fire and start, I think these boilers require more cleaning of fly ash than the other boilers listed from what I have read. To be clear, the LL website indicates the 220,000 btu/hr is the gross input, not output. Gross output is lower than gross input (e.g., because some heat goes up the flue) and net output is lower than gross output due to distribution system losses normally accounted for through a "pick-up" factor. Last edited by Pacowy on Mon. Feb. 11, 2019 1:36 pm, edited 1 time in total. To be clear, the LL website indicates the 220,000 btu/hr is the gross input, not output. Gross output is lower than gross input (e.g., because some heat goes up the flue) and net output is lower that gross output due to distribution system losses normally accounted for through a "pick-up" factor. That's why I wanted to make that clear as I just seen the 220,000 BTU. Boiler works great, just not large enough for my heating needs on the coldest days. If it was 220k net I would be golden.